The Big Boy 2 loading ramp is by far the most innovative ramp system to hit the market! Packed full of features allowing you to load not just motorcycles, but ATV's, golf carts, UTV's, zero turn lawnmowers, and just about any pneumatic wheel vehicle up to 2500 lbs.! The whole system only weighs 86 lbs. 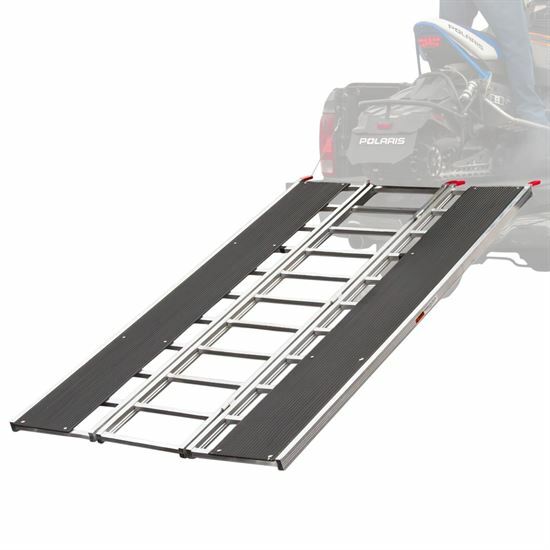 The Black Widow motorcycle loading ramp system is an all aluminum, multi-purpose, heavy duty aluminum ramp system that works for motorcycles, Atv's, tractors, or just about anything that needs loading. This ramp has 3 heavy duty sections which can each be used separately or can all be bolted together for one rock solid system. This extra wide system makes loading a motorcycle with one person a snap. This system is an indispensable tool to the user who owns multiple recreational vehicles that need loading but does not want to spend a fortune on multiple systems. The Black Widow single folding motorcycle ramp is an 17" wide motorcycle loading ramp that folds to half it's length for compact storage. The extra width of this single loading ramp makes it much more forgiving than most single runner ramps when pushing up a street bike or off road bike . The heavy duty center takes a bike up to 1500 lbs. & the ramp also can load Atv's, small garden tractors & more. You will find that these light weight power houses are impossible for your customers to resist. The IBF bi-folding series of ramps fold to half their width and can be deployed in seconds. The IBF-7144 is a 71" long by 44" wide lightweight bi-fold ramp with serrated circular cross bar rungs and rubber fingers. The IBF-7148 is 71" long and 48" wide for loading wider Atvâ€™s. It folds in half and has a light weight square bar cross rung design. The 1000 lb. total capacity. The whole system only weighs 36 lbs. Black Ice ramps have a trifold design making them easy to move around and store. (c) Copyright 2019 Hitch Corner, Inc.